Freshly shaven legs–is there a better feeling in this world than that smooth and soft skin that results from a good shave? It’s no surprise that a razor will help you achieve this effect. But disposable blades come with a few issues of their own. From razor burns to unwanted nicks, disposable shavers can be tricky to use. So to help you ditch this problem altogether, we created a list of the best electric lady shavers in the UK to help you get that close, near-perfect shave. But before we delve into the action, you might be wondering—is there really that big of a difference between electric lady shavers? At the end of the day, they all run on batteries and cut hair, right? Surprisingly, you’ll find each electric lady shaver differs quite a bit from the others. That’s not to say that one is necessarily better than the other. But when finding the best lady shaver, you’ll need to consider what you want from a razor. Is a great bikini trimmer something your razor needs? Or maybe you prefer a lady shaver for sensitive skin. Whatever the reasons, you’ll find some of these razors perform certain jobs better than their competition. So, are you ready to throw away your last disposable razor? Then read along with us as we explore the best lady shavers in the UK. So we promised you a list of the best lady shavers in the UK. And we’re certainly going to deliver. We invested hours testing each of these products to ensure you find the best women’s razor on the market. So, without further ado, let’s get to those reviews! When it comes to getting a close shave, few razors come close to competing with the Philips SatinShave Prestige Lady Shaver. For starters, the dual floating foil system glides over your body while trimming those short hairs during the process. Meanwhile, the multiflex head allows the razor to bend over those tight contours under your arms and legs. To make matters better, you won’t need to worry about scratches and cuts either since the blade rounds the tips in front and behind the foil. And speaking of shaves—you’ll be doing that frequently, as the charger only requires a one-hour charge time. And if that’s still not enough, you can make use of the five-minute quick charge for a last minute shave. Furthermore, the battery indicator light shows when your shaver’s battery is low or charging. So you can plan your charges in advance. Lastly, we were pretty big fans of the included attachments. The bikini trimmer is one of the best we found on the market. And the skin stretcher cap tightens your skin to allow you to trim even the shortest of hairs. If we had any complaints here, it’s that the skin cap did have a habit of pinching skin—but this is only a minor gripe when compared to everything this razor does right. Skin stretcher cap is great for close shaves. Bikini trimmer does its job well. Sometimes leaves stubble in dense areas. Dry shaves leave stubble on the first run. Skin cap has a habit of pinching skin at times. The Philips Satinshave prestige is one of the best lady shavers you’ll find on the market. Few other women’s razors offer quite the close shave as this Philips model. At the same time, there’s little to dislike here as the razor offers a fast charge option and is comfortable to use. If you can get past some occasional tugs and pinches with the skin cap, this is a razor that will leave you with some silky smooth skin. 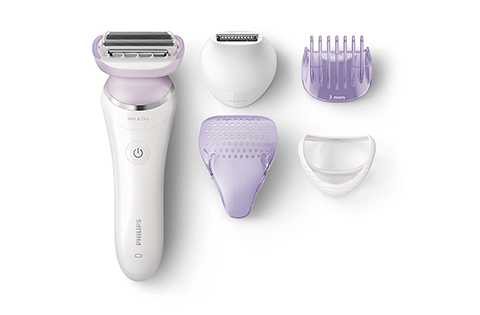 Braun is at it again with a fantastic lady shaver in the form of its Silk-épil LS5560. Right out of the box, you’ll find three attachments to help you get the perfect shave—a bikini trimmer, exfoliator, and an optishave head, which stretches the skin for a super close shave. The 4 mm bikini trimmer allows for precise shaving in those intimate areas. Meanwhile, the floating foil and trimmer adjust seamlessly to your body’s every contour–which allows for a smooth shave. And the great shaves only continue in the underarm region with the rounded head. With the foil’s rounded shape, this razor will painlessly deliver a close shave to any concave body area. 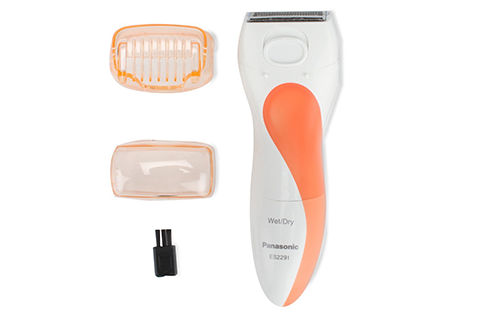 Combined with the gliding cap, your skin will never feel irritated while using this shaver. Overall, the double-care technology does a great job of trimming hairs while offering a smooth, exfoliated finish. You even receive two different shave options here–underarm/ bikini shave and Leg shave. In other words, non-sensitive and sensitive areas. And switching between these modes occurs with the flick of a switch. As you’d expect from the best, this lady razor allows for wet shaves–and is fully washable. So feel free to shave in the bath or shower. For best results, clean shaves occur from running the shaver over the same areas repeatedly. And, during our tests, the exfoliating head offered the best shaves. Alongside a great shave, be sure not to overlook the grip. Everything about this razor feels like a quality product. Moreover, this lady shaver even comes with a nifty little bag to hold the razor, charger, and all other accessories. Lastly, this shaver does come with a rechargeable battery with an impressive 40-minute shave time. Sadly, the charger does lack a UK plug-in prong—so you’ll need to buy a separate adapter. Also, this shaver is quite noisy–so be aware of that if you need to shave in quiet. You’ll get a two-year warranty with this shaver. So you’re well-protected should any parts stop functioning properly. Floating foils are great for sensitive skin. Attachments are plasticky and feel flimsy. Replacement foils can be expensive. Only comes with a Europe-head plug-in—you’ll need a separate adapter. Doesn’t give a very close, smooth finish — great if you’re blonde and/or have fine body hair though. If you’re looking for an overall great shave, the Braun Silk-épil LS5560 will get the job done! This razor offered some really smooth shaves during our tests with its floating foils. On the downside, British buyers will need to buy a plug-in adapter to charge this shaver. But with such impressive battery life and shaving power, it’s a minor fault. If you have sensitive skin, you know how dreadful shaving can seem. But the Remington WDF4840 is here to remind us that there are razors out there that that won’t irritate your skin. For starters, there are the two hypoallergenic floating foil heads that allow for a close, yet smooth shave without the irritated skin. 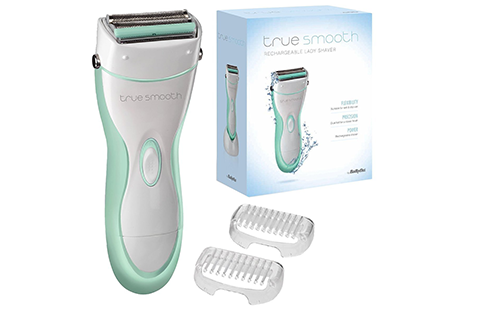 Also, the trimmer comes with an aloe vera strip to soothe your skin during your shaves. And don’t forget the smooth and gentle bikini trimming attachment—which also delivers a precise trim. Even better—this lady shaver is waterproof—so feel free to use it with creams and gels for a comfortable shave. And don’t worry about dropping this shaver in the shower or bath, as it comes with an anti-slip grip, which feels very comfortable to hold. The only downside here is that button feels a bit stiff to move with wet hands–but it’s nothing major. As far as battery life goes, things could be better, as the shaver only allows for 30 minutes of continuous use after a long 20-hour charge. Also, Remington suggests replacing the foil and cutters every six months. Sadly, obtaining the replacement parts is not easy. Remington offers a 12-month warranty with this shaver. And if you register in the first 28 days, you’ll get an extra 12 months tacked on the original warranty. All-around great for sensitive skin. The button is a bit stiff to move especially if your hands are wet. If you’re looking for the best lady shaver for sensitive skin, Remington designed its WDF4840 with you in mind! All of this razor’s features cater toward delicate skin to prevent any irritation. The low battery life is annoying. But it’s far from a deal breaker when considering all of what this women’s razor has to offer. Adding to the list of great all-around lady razors is the Babyliss 8770BU. The dual foils on this shaver will trim any hairs in their path—including facial stubble. Even better—trimming your hairs is a painless experience. You won’t feel any excessive pulling or tugging. There’s also the rechargeable battery that allows for a 30-minute continuous shave after a 16-hour charge. It’s a battery life is a bit low, but nothing unbearable. To compensate, this lady shaver offers two comb guides at 2mm and 4mm—so you can trim hair in some areas to the lengths you want! Lastly, this lady razor is comfortable to hold with its ergonomic design. And with a three-year guarantee, you’re protected for quite some time in case any parts stop working. Comb guides are nice for trimming. Clean shaves take longer than other razors. When searching for the best women’s razor, you’ll want something that performs well. And the Babyliss 8770BU does just that. You’ll find this shaver removes stubble with no issues at all. And the fact that this is a waterproof lady shaver only sweetens the deal. If you can get past the short battery life and taking more time for that smooth shave, this razor will easily cover all your needs. With its ES2291D, Panasonic brings us a travel razor that is great for sensitive skin. The hypoallergenic, nickel-free stainless steel foil blades will offer you a close shave without any redness or irritation. Meanwhile, the soothing strip does just as the name says—soothes your skin for the smoothest possible shave. And speaking of smooth shaves, the pivoting head will allow you to reach every inch of your body with ease. And to tie this package together nicely, Panasonic included an ergonomic design. So the non-slip grip will prevent any accidents. 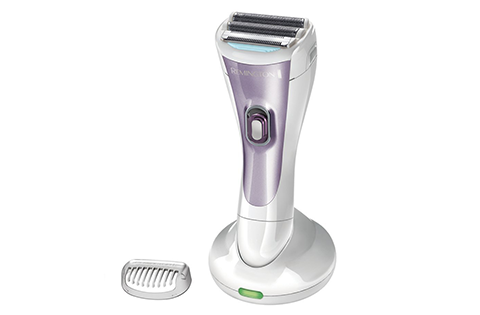 And to separate this ladies’ shaver from others on our list, this one runs on two AAA batteries. The AAA batteries are replaceable—so no more waiting for charges to get going. If we had any complaints, it would be the pop-up bikini trimmer design—which has habits of not staying popped up. Keep in mind that this razor ships with a two-year warranty. Smoothing strips are a nice touch. Pivoting heads for close shave. Pop-up trimmer does not always stay popped up. Easy to accidentally shut off razor during uses. Not the sharpest of blades. If you need a great overall women’s razor, give the Panasonic ES2291D a close look. This shaver caters to sensitive skin while also offering a great shave. And the contouring head really makes for a great experience. 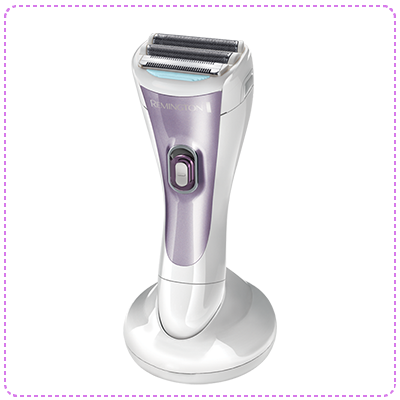 In fact, this feature alone makes this razor one of the best lady shavers for underarms. Even with some annoying design choices, this Panasonic razor offers a shave like none other. Which Lady Shaver is the Best? So, now that we’ve provided you with some lady shaver reviews, it’s time to pick the best. Keep in mind that all five of these women’s razors are great. So make sure you make your pick based on features that appeal to you. When it comes to sensitive skin, you’ve got two fantastic options here. 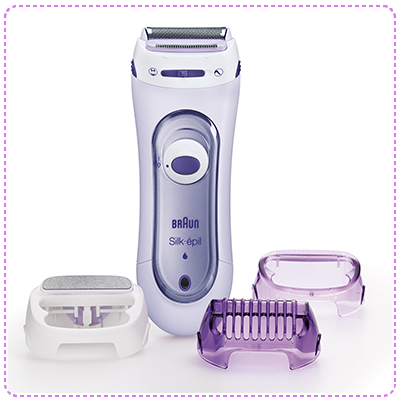 Your first choice is the Braun Silk-épil LS5560, which offers nearly every feature your skin could ever want. Meanwhile, the Panasonic ES2291D offers hypoallergenic blades and great all-around features for a smooth shave. If price is not an issue for you, then check out the Philips SatinShave. This lady shaver will offer you some fantastic battery life and attachments to meet any of your shaving needs. And lastly, if you’re looking for a budget-friendly lady shaver, then you can’t go wrong with the Babyliss 8770BU and Remington WDF4840. But don’t let that price tag fool you. 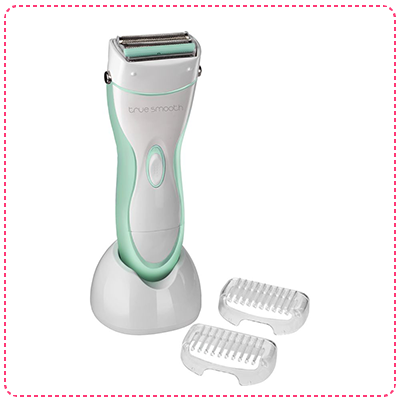 Both these lady shavers are packing some great features. Need some help deciding which shaver to choose? That’s where we step in. When it comes to buying the best lady shaver, you’ll want to learn some key specs and features. Read through this guide, and you’ll be more than ready to select the best women’s razor for you! When shopping for an electric shaver, you’ll come across two types of blades—rotary and foil. And yes, both these blades are pretty different from each other. Rotary: Rotary shavers included rounded blades that turn in a circular motion. They also flex—so they fit extremely well into those tight spaces. In other words, these are ideal for your face. And generally, they are pretty rare in women’s shavers. Foil: This is that bar shape you see on the top of the shaver. Usually, these blades pivot rather than flex. So these work better for large surface areas such as your arms. These are very common when it comes to women’s razors. And if you’re looking for the best lady shavers for legs, this is the blade you’ll want to find. When shopping for the best lady shaver, you’re going to want something that will nicely fit in your hand. As a general rule of thumb, women’s electric razors tend to be a bit smaller and lighter to better fit the female hand. If you want a wet and dry electric shaver, you’ll probably want a specialized grip as well. Many lady shavers offer non-slip grips to help you better grasp the razor. So if you plan to shave in the tub or shower, check for this feature. Generally speaking, dry shavers will save you some money. But keep in mind that you can only use these shavers on dry skin. So if you need a quick touch up, these shavers work just fine. Also, note that you cannot bring a dry only razor in the tup or shower with you—otherwise, you break the shaver. As far as wet razors go, you can bring these in the shower or tub with you. More importantly, wet razors will allow you to apply creams and gels for closer shaves. Another great feature of wet shavers is the cleaning—you can actually rinse these under running water. So if you have sensitive skin or want to save some time cleaning, a wet shaver is your best choice. For batteries, you’ll find two types in the form of rechargeable and replaceable. The best rechargeable batteries will offer both fast charge times and great battery life. As a whole, many can charge in as fast as an hour. Others will require upwards of 20 hours before reaching a full charge. And as far as battery life goes, most range from 20 minutes to a full hour. If you’re in a hurry, check for quick charge options. These allow you to charge your razor in as fast as five minutes to receive a quick shave. Lastly, you’ll want to check the charger prongs for rechargeable lady shavers. Some are not suited for a UK outlet—so you’ll need to purchase a separate adapter in these cases. Over time, you will need to replace your electric lady shavers blades. In these cases, you’ll want to check the prices. Some foils can become pretty pricey, so plan accordingly. 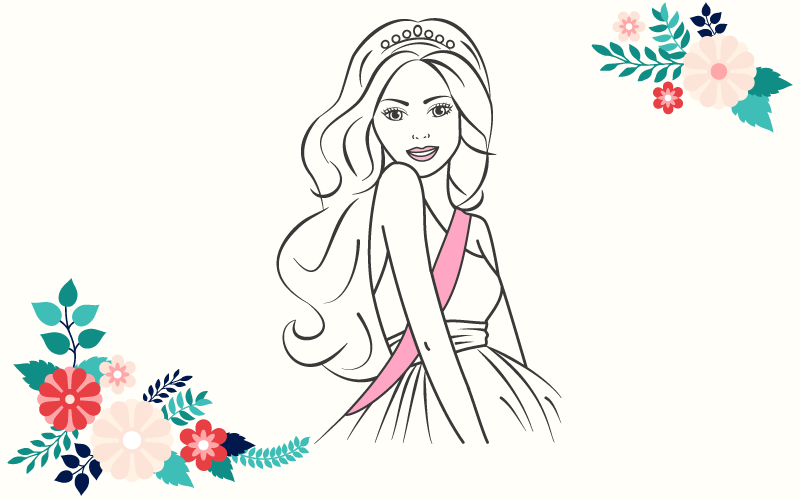 With the best lady shavers, your trimming options will extend far beyond the foil heads. Today, bikini trimmers are popular attachments for most lady razors. Meanwhile, exfoliators and skin pressers can add some help to getting that perfect shave. Overall, check your attachments and make sure your lady shaver comes with the ones you need. Don’t you hate those times when you’re in a rush and realise you forgot to charge your shaver? Then quick charge is the feature for you. This option allows you to quickly charge your dead shaver in about five minutes. As a whole, quick charges will usually allow you to complete a full shave. Anyone with sensitive skin knows razors can cause annoying irritation. But thankfully, there are options out there for you. Generally, hypoallergenic foils and built-in moisturising shaving systems will negate this problem. Before we conclude today, we know you still have a few questions. So we’ll give you the answers to some of the most common questions we receive. Are lady shavers better than razors? Really, this one is all about preference. 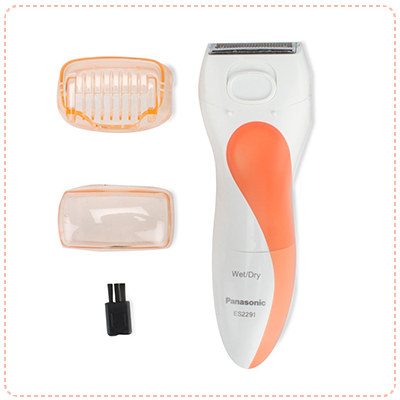 But if you’re ready to say goodbye to ingrown hairs, then a lady shaver will be the choice for you. Lady shavers also produce fewer nicks and cuts. So if this sounds appealing to you, then lady shavers are the better option here. No—lady shavers won’t hurt you if you’re using them right. You might feel an occasional pinch or pull (mostly when the battery is low). But even this is relatively painless and more of a surprise. How good are lady shavers? Simply put—the best lady shavers are pretty good. Overall, they provide a smooth and painless shave. Even better, they work for areas throughout the entire body. Which is better—lady shaver or epilator? Again, this answer will vary from person to person. But generally speaking, lady shavers hurt much less and allow for fast shaves. Epilators, on the other hand, can hurt and in most cases take at least 40 minutes to remove hair from both legs. That’s not to say epilators are worse than shavers. In fact, these devices will pull hair from the root, rather than simply cut it. 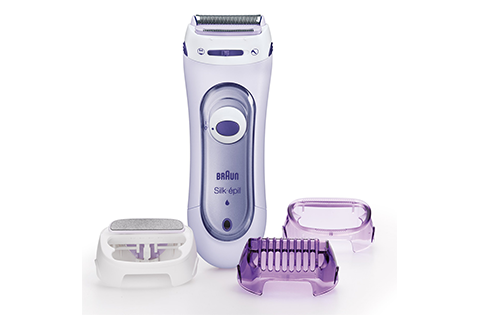 Thus, hair grows back much more slowly with an epilator (usually 3 to 4 weeks). The main problem with shavers is that they only trim hair at the surface of the skin. So the hair grows back much more quickly. What is a lady shaver used for? In simple terms, a lady shaver will trim hair from anywhere on the body. Usually, lady shavers are more geared for the female body. So, unlike male electric razors, they’re built to cover more surface area. Also, many come with attachments to make some jobs easier. One example is bikini trimmers for trimming those hairs in the bikini region. How do lady shavers work? For the most part, lady shavers work similar to an electric razor. A foil blade trims and cuts hairs at the skin’s level. Most are battery powered and rechargeable. And the products featured on our list are suitable for use in water. Smooth hairless skin feels great. But it does not need to be painful or time-consuming to achieve. By adding a lady shaver to your grooming routine, you’ll easily cut back on the time you typically take to shave. Plus, you’ll find plenty of options to ensure your skin can feel its absolute best. The market is filled with plenty of lady shavers. So make your pick based on the features you want. And if you need, don’t be afraid to review our list as many times as you need. We did the hard part by weeding out the duds. 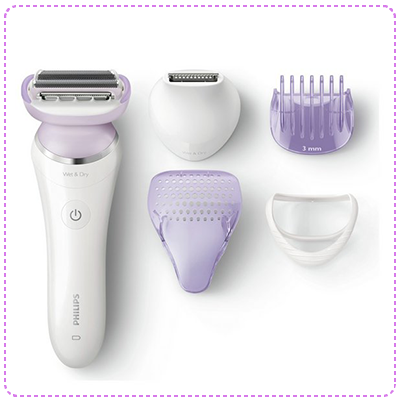 Now it’s your turn to pick the best lady shaver for yourself.